Situé à cinq minutes quarante. de Halifax sur la rive sud incomparable de la Nouvelle-Écosse cette propriété Oceanside est niché au cœur de Northwest Cove .Voir les bateaux de pêche se dirigent et reviennent avec la pêche de leur journée. Louez un kayak (ou un vélo) ou tout simplement marcher dans les criques et les plages voisines. Poisson ou le tuba à partir du quai. Avoir un bar-b-que et de terminer la journée par un feu de camp crépitant. Photographes, artistes, méfiez-vous! Vous ne voudrez plus jamais quitter! Services bancaires, commerciaux 10 minutes. un moyen. Historique Mahone Bay, Lunenburg et de Peggy Cove quarante-cinq minutes. What an incredible setting! Waking up to the water every morning was unreal. We stayed here to have one place for our family to be together while attending a wedding weekend at the Shore Club in Hubbards. It was roomy, clean, and perfect for our large, multi-generational group. We'll definitely book again - thank you very much, Kelly! Wonderful roomy place with all the amenities for an enjoyable stay. Enjoyed our 2nd stay at the cottage in Northwest Cove. Everything was comfortable and clean and all 12 of us had lots of room to enjoy. Kitchen is well equipped and everything you can think of and/or need is provided. We will be back next year for our annual get together. So nice to see the sunset and enjoy the beautiful deck and scenery. Thanks Kelly for helping us have a wonderful stay. My 5 sisters and I enjoyed our stay and had a great time. Sunny weather would have been great but all in all it didn't matter. Great house for a larger group wanting "elbow room"
Our group of 9 adults wanted a vacation home on the water, with space to be together as well as comfortable, private areas. This home absolutely delivered on those points and many others! The bedrooms are spacious and comfortable, and 3 bathrooms provided enough facilities to avoid long lineups for showers etc. The sunroom and deck areas were used a lot during our stay the first week of September (perfect weather blessed us). Every kitchen item needed was present … the only thing we didn't locate was a garlic press! The outdoor grill was great for many of our meals, but could use a cleaning after likely a long summer of grill masters using it. Our host, Kelly, was super and helped quickly when we needed anything. We enjoyed learning a bit more about the area from him and appreciated his availability without infringing in any way on our privacy. The only other (minor) recommendation we came up with would be a dishwasher in the main kitchen (there is one in the second kitchen). We adapted by carrying the dirty dishes to the other kitchen on trays, so it isn't a big deal. A refrigerator in each kitchen came in handy too! 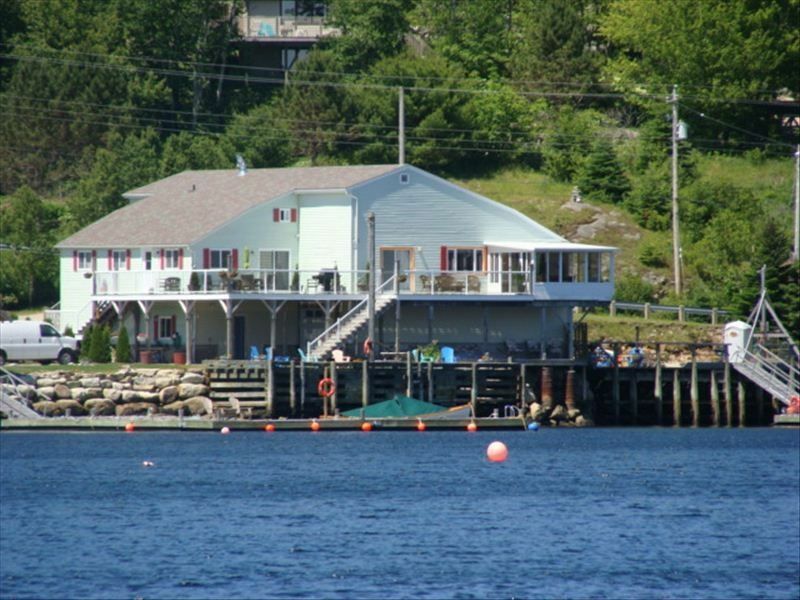 The highlights for us were location (on the water but close to town of Hubbards), comfortable and clean lodgings, sufficient dining seating for all of us and spacious sleeping quarters with queen beds in 4 of the bedrooms (6 bedrooms total). The drive to Hubbards was about 15 minutes on a well-paved road, and groceries, liquor and a few restaurants are available there. Lobster supper at the Shore Club in Hubbbards was another highlight for our group. Other homes may be more elegant, but this one suited our group perfectly. We also appreciated that parking for 4 cars was available. Highly recommend this home for a group like ours. Thank you Kelly!! This place was amazing! Kelly, thank you so much for sharing your home with us. The weather couldn't have been more perfect. Refreshing early morning swim. Fishing off the dock and room to dock a boat. Lots of room for everyone (10 of us) to spread out. The screened patio was a perfect game room. The washer & dryer were a nice touch and made packing to go home super simple. I can think of no better way to start the day than to have my morning coffee out on the deck. Absolutely tranquil! Notre établissement se dresse fièrement dans Northwest Cove sur la péninsule Aspotogan (Blandford) dans le comté de Lunenburg. Pendant des siècles, les habitants ont gagné leur subsistance de l'océan et cette tradition maritime est bel et bien vivant. Le thon, le maquereau, l'églefin, le flétan, le lieu jaune et le homard sont encore amenés à terre. Hubbards, la communauté 10 minutes »a'hub, a distance des commerces, des banques, des restaurants, des espaces communautaires, Sat. danses de nuit et un marché très populaire des agriculteurs de week-end. Si votre désir est un voyage «local» Venez séjourner chez nous. Historique de Chester Halifax, Lunenburg, Mahone Bay, crique de Peggy et de la vallée de l'Annapolis en une heure.